The telephone inside these kiosks was linked to the local police station, and the flashing light on the top told the officer on the beat that his presence was required. Joe Public could also use it to summon police, fire or ambulance. 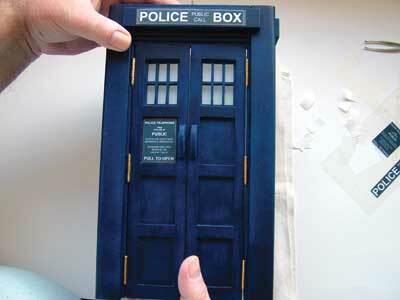 They were displaced in the 1960s by two-way radios at roughly the time that Dr Who made his first appearance in one. 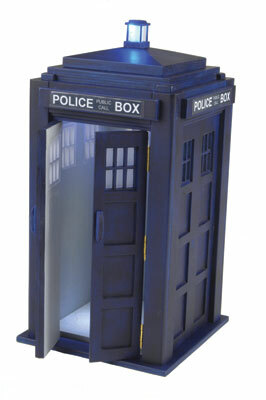 This model is made from 6 and 3mm ply and the blue beacon and white interior lights are switch-operated. 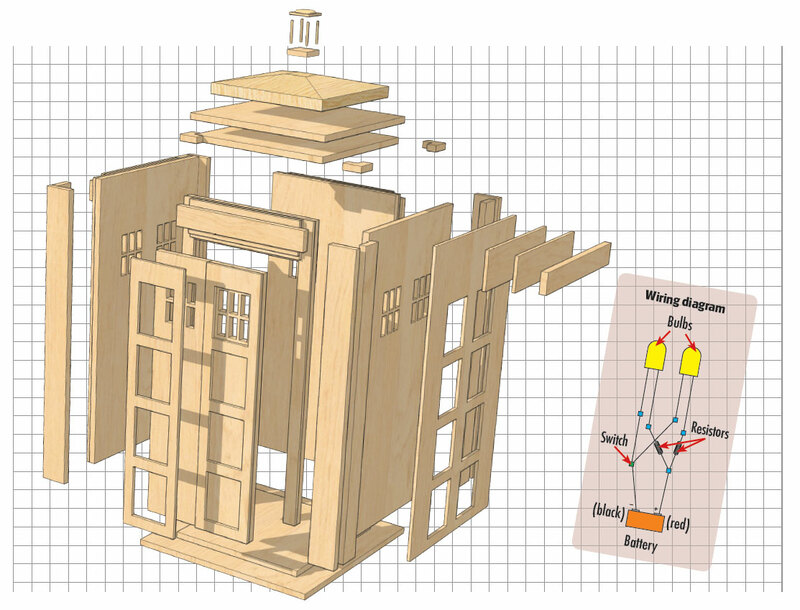 After enlarging the main pattern make four copies, three to stick to the plywood side panels and one to be used as a measurement guide and place reference. 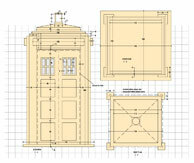 Cut the 6 and 3mm plywood side panels to size then sand the top surfaces smooth before cutting out the windows and panelling detail. 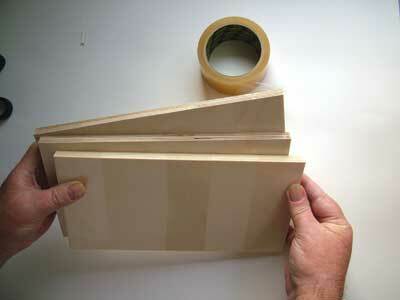 Using wide Sellotape, tape together all four of the 3mm panels then tape the 6mm panels into two separate pairs. 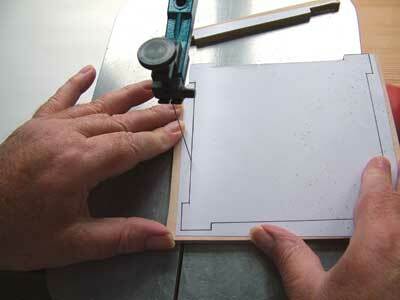 Cut three of the paper patterns around the panel section to fit exactly onto the side panel pieces. 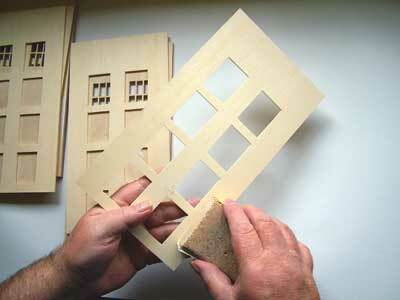 Use the glue stick to attach the two window detail patterns to the pair of 6mm plywood panels, and the panelling detailed pattern to the 3mm panels. Drill a 3mm hole in each of the marked openings, thread a 5mm blade through each hole in turn and attach it to the scrollsaw, cut right into the corner of the opening then back out the blade just enough to make the turn, and remove the waste. 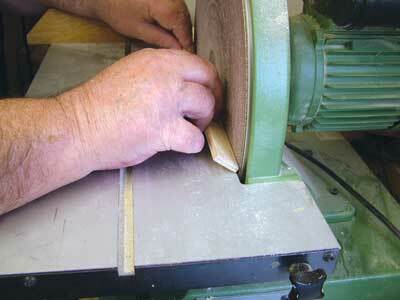 Remove the tape and patterns, sand the openings with 220-320-grit paper and remove the fine dust with a Tack cloth. 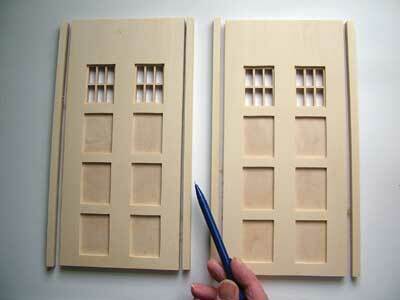 Brush glue evenly over the underside of the 3mm panel. 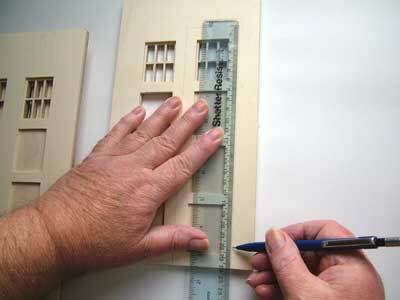 Turn the panel over and align with the top of the 6mm panel, press firmly into place and secure with masking tape. 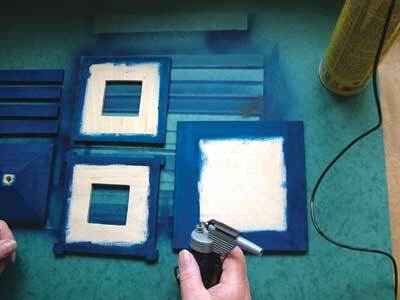 Remove any excess glue and repeat with the remaining six panels. 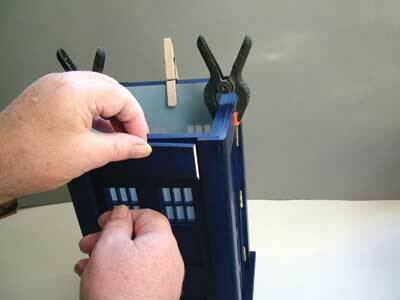 Set aside to allow the glue to cure. When the panels are dry trim two down by 9mm on both sides so when the four sides are placed together they will make a square. 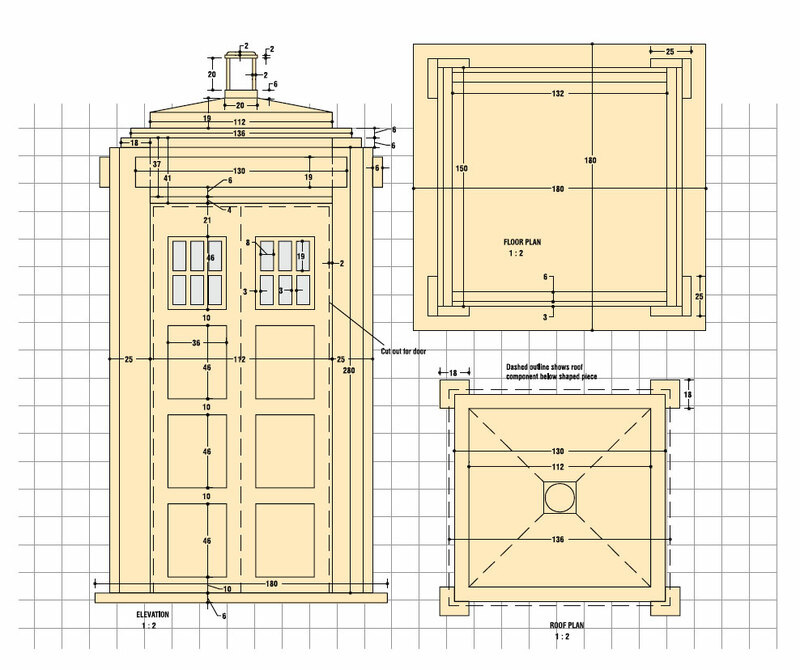 Referring to the pattern, measure, mark and cut out the two doors from the front panel. Before cutting out the beacon components drill a 6mm hole in the centre of the lower square (for the blue bulb) and four 2mm holes, one for each corner of the lower and upper squares, being careful not to drill all the way through the thin upper square. 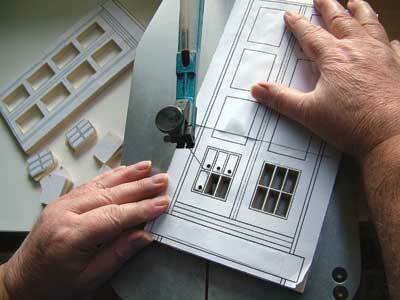 Continue to cut out all the pieces. 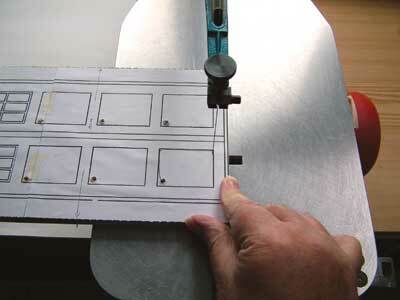 Position the hinges, three on each side of the frame opening, mark their location on both the frame and doors, then cut out the recess to a depth of 0.5-1mm. 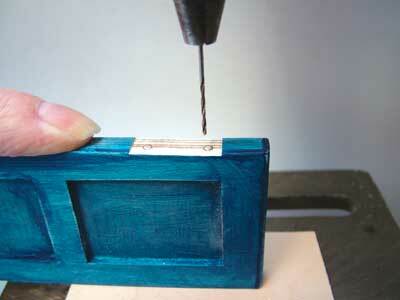 Use a 1mm drill bit to make a pilot hole for each of the screws. Drill a 6mm centre hole in the top roof piece to take the blue light, then cut out the centre of the two inner roof pieces to make a recess for concealing the light workings. 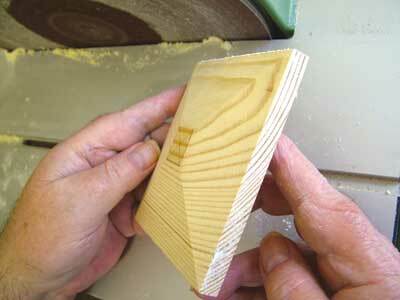 Disc sand carefully to round over one edge, along the length of the four wider corner mouldings. 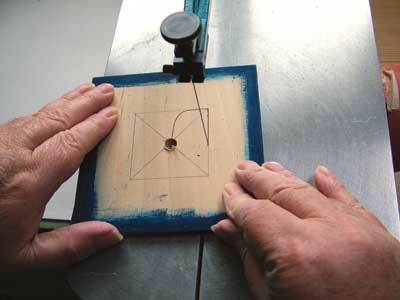 Prior to sanding the top roof piece, measure and mark a 20mm square in the centre for the location of the beacon. 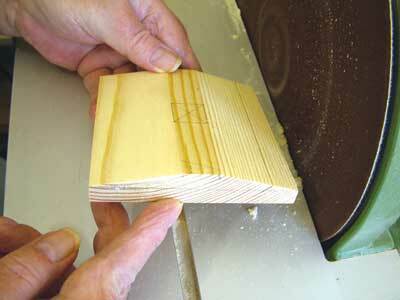 Also mark a centre line all the way around the side edge to help maintain an even thickness while sanding. Carefully hold the piece against the disc sander at an angle and sand down only as far as your pencil lines, turn the piece round and sand the opposite side before progressing to the other two sides. Round over the tops of the handles and use a triangular needle file to help create the side detail before going through the grits to hand sand all the pieces smooth. After sealing all plywood surfaces with acrylic sanding sealer and allowing it to dry, mix the ultramarine blue with a very small amount of black to obtain the desired shade of blue, then dilute the paint by 10% to make it easier to work with, and paint all the outer surfaces. 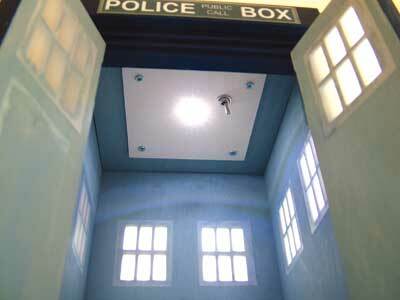 Paint the inner walls light grey. 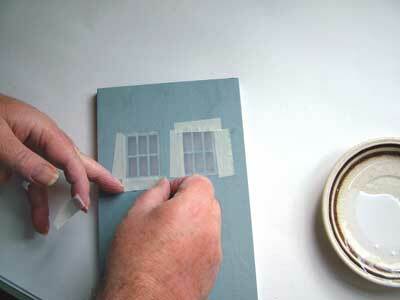 Dilute a small quantity of PVA glue with water and spread it out evenly around the 'window' tracing paper oblongs and glazing bars. 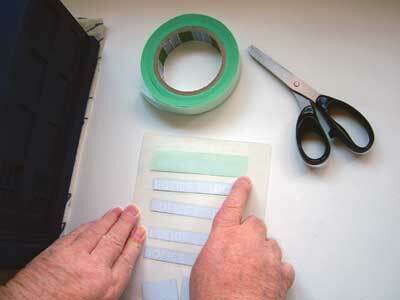 To keep the paper from curing up while drying, attach strips of masking tape around the four sides. To make the beacon light, roll up a small length of tracing paper around an 8mm dowel secured with Sellotape and superglue this within the beacon frame. 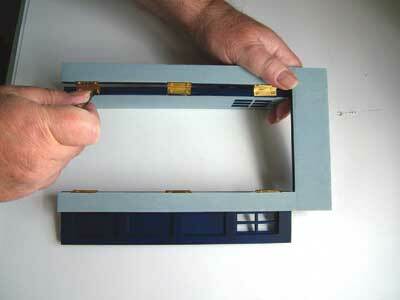 Attach the hinges to the doors and then to the frame, and stick the floor to the baseplate with PVA. 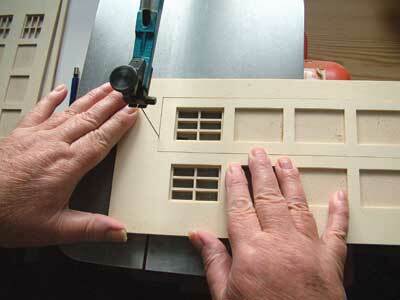 Next, glue and pin the side panels together, wiping away surplus glue, then pair up the corner mouldings and glue each pair in position, secure and allow the glue to cure. Glue the top facer boards in position and clamp to secure, then attach the sign boards before gluing up the detachable roof. 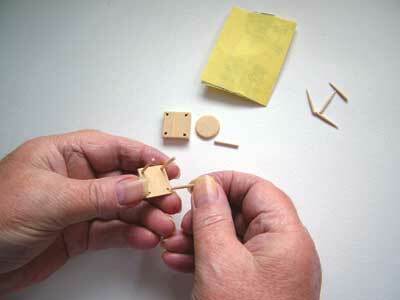 The small pieces of the beacon and the door handles are fixed with superglue. 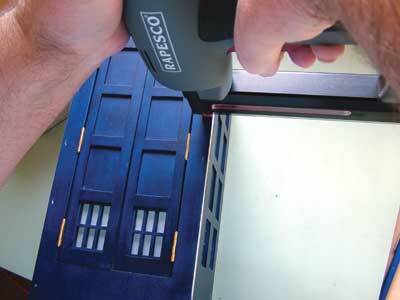 Make and laminate four Police Call Box signs, not shown, and one for the door and attach with double-sided tape. The bulb has two connectors. The longer, positive, one is attached to the resistor and the resistor is then wired to the positive battery terminal (red). The negative, shorter, one is attached to the switch and then on to the negative battery terminal (black) to make a circuit. 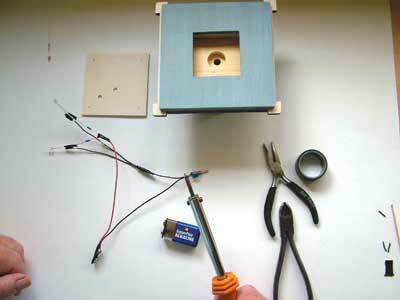 Push the blue bulb up through the hole into the beacon and secure in place with a small piece of white tack. Position the white bulb and switch into the pre-drilled holes in the cover plate, then carefully push the wiring up into the roof recess. 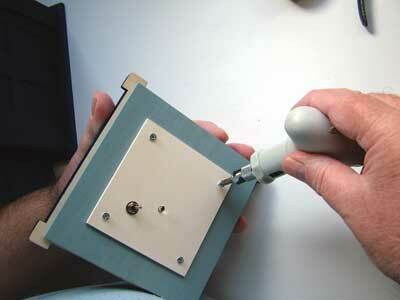 Secure the cover plate with the four small screws. The disc sander is a quick and accurate way of sanding ends and edges of components flat or creating external (convex) curves. 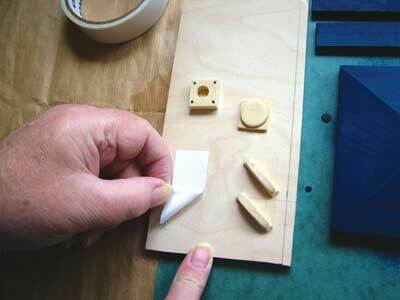 The components sit on a table in front of the disc that can be angled for compound angle sanding. It is important to only use the half of the table where the disc's rotation is downwards so the workpiece stays pressed on the table otherwise the workpiece will fly upwards which can be alarming. Extraction is absolutely essential as lots of fine dust is created. Discs of different abrasive grade can be used depending on how aggressive or fine you want the sanding to be. 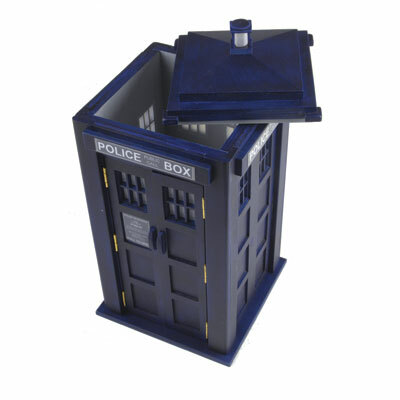 "They were displaced in the 1960s by two-way radios at roughly the time that Dr Who made his first appearance in one"